I feel like I’m dying. I feel like every single one of my parts is shutting down, or if not shutting down, giving their most minimal effort. It’s hard to get out of my bed in the morning, it’s a process. It’s 45 minutes of begging and cajoling and promising and breaking promises, of my knees threatening mutiny while my back joins in and my brain wonders, what’s the point? What’s the point? I’m not old enough to be like this. I’m not old. I don’t smoke, I hardly drink. It’s just something that I’ve thought ever since I learned Newtonian Physics back when I was a kid and they told us it was all because of an apple hitting him in the head. Gravity pulls a little harder on me. It’s like some taller guy comes up behind me and just constantly presses down on my shoulders, pushing me further into my shoes. I tell you, I go through the soles of my sneakers way faster than I should. When it’s muddy out, I sink lower. I can feel it. And my bones don’t know what to do, under all that pressure to perform the same daily tasks of riding my bike to school and to my job, the same things everyone else does, but they don’t have my constant strain. Sometimes I dream about Newton, going up to him and asking him about what he thought about my problem. I’d point to my bike tires. Newton, I’d say, they lose air so quickly. On my bike, when I get going, that’s the only time the weight is lifted, like that bully who holds me down can’t keep up. I transfer all of that heaviness to the bike, and that’s why my tires bend unnaturally, and lose their shape, and do all the things that tires aren’t supposed to do. But it doesn’t matter, I can fix it. I’ll fix it to feel light. Somebody might say that I’m fat, but look at me. I’m thin as a rail. I weigh 40 pounds less than I should. But the springs in my bed still groan when I lay down, initially resisting and then giving in to my weight, knowing that as soon as I envelop myself in its sheets, I’m anchored there for as long as I possibly can. Soon, when I start to rustle my sheets, my bed sighs. It has me. This isn’t an excuse. It’s an explanation. It’s why I hang my head when I walk, why I found the boy’s birthday card on the floor. And here’s why I opened it, why I took the money, why I did it without thinking. I could make myself feel better about it by pretending like the money was payback. Here you go, fate was saying. Gravity is playing an evil trick on you. Here’s 40 dollars. I bought new grips with that money, and rust remover for the handlebars. And then I found another kid’s card a couple days later, took it right out when I saw the bright envelope; if not me, it’d be someone else – I bet all petty thieves steal the bright envelopes, hoping for money inside. And karma paid me back again. 100 dollars, for graduating – or for dealing with the sheer difficulty of extricating myself from the sheets. I bought a nice new seat with that money. I felt lighter than ever when I rode, I didn’t think about who didn’t get their money, I just thought about me. I woke up one morning and I hopped out of bed because I knew it was Monday and the mail was going to come, and I had gotten the new pedals and the stronger frames for the wheels and now I wanted something different – a better light for the front so I could feel safer riding at night, maybe. Something. There’s a lot that karma could pay for. Mail never comes for me – just mailers. Junk mail. Stupid mail that makes me mad I exist. I left marks in the hall carpet while I was there at the mailboxes, ripping my trash in half, leaving marks like a bookshelf that has stayed in the same place and left grooves in the carpet. I reopened my mailbox and I put my hand all the way through my box and reached over, letting my long fingers wend my way into the box next to mine. To the left, to the right, above, below. I found bills and the same junk mail and only once piece of mail that was interesting. Big and white, with curlicue calligraphy and Mr. And Mrs. in the title. I opened it and found myself staring at a blank check. For a wedding, for whatever present they liked, from so-and-so, and so-and-so’s wife, and you can call them Dad and Mom, but you don’t have to just yet if that makes you feel uncomfortable. I held the blank check and thought about the bike I could buy. I walked over to the cycling shop and saw things that would help me fly across the pavement to all the things that I hate doing and have to try to accomplish before my body gives out and says enough is enough. I looked at my bike out the window and saw the handlebars and the grips and everything and then I took a walk outside and my whole body screamed at me to take a taxi to the nearest mattress store. I don’t feel bad about the money I have or the blank check that’s going to buy my bike. The universe is giving me that money. I stop into a store and buy a soda, drink half of it and feel horrible. I’ll buy that bike, I decide. The one that’s a better version than mine. I’m not even mad when I get back to my bike and everything I bought is gone. Karma gave me this blank check for a reason. Posted on Sunday October 31st, 2010 Thursday April 2nd, 2015 by Max Elman. 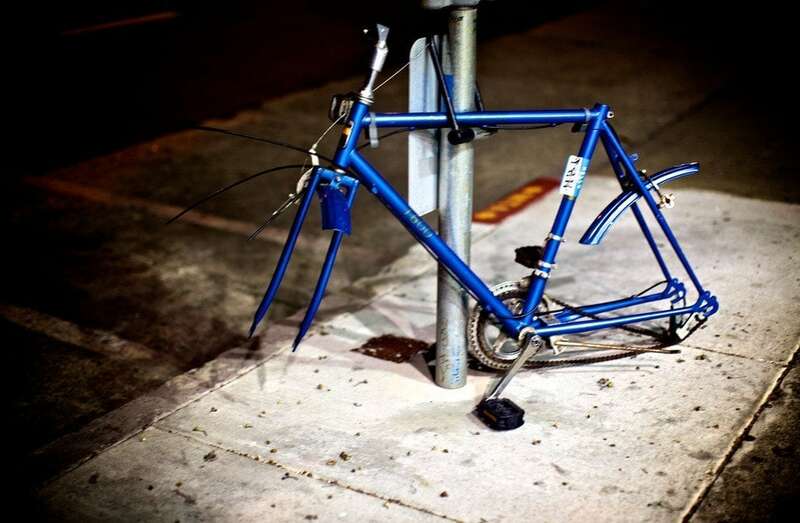 This entry was posted in Photos & Stories and tagged bike, night. Bookmark the permalink. I'm struck by how often your stories are about wanting money. This would make a good main character for a longer piece.